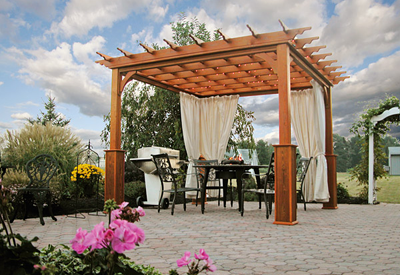 Unstained pressure-treated pine wood, solid laminated 5″x5″ posts, solid 2″x6″ joists spans shorter side & 2″x4″ runners span longer side, both with scalloped ends and notched intersections to resist warping. Heavy duty double 2×6 header with braces for rigidity, mounting brackets for concrete pad and wood decks. Maintenance free white vinyl structure over pressure treated wood for superior strength and long life. Vinyl 5×5 wood posts sleeved with white vinyl, 1½” x 5½” Joists with decorative scalloped end caps span short side, 1½” square runners with decorative diamond end caps span longer side, heavy duty double 2×6 header with braces for rigidity, mounting brackets for concrete pad and wood decks. 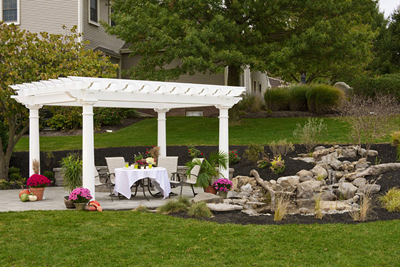 With a vinyl pergola you don’t have to deal with the hassles of maintenance. 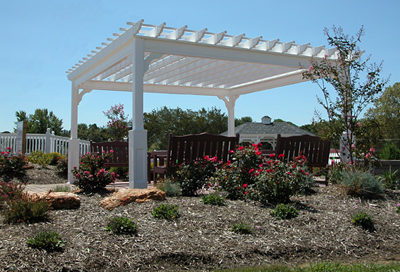 Your vinyl pergola is designed for easy, worry-free care with your family’s safety and enjoyment in mind. Cedar Wood Top, Pre-Stained to your choice of one of our available standard stain colors. Pressure treated wood 6×6 posts sleeved in white vinyl with decorative base and capital. Double ply 2×8 headers on all four sides creates a completely finished look. 2×6 Joists (Rough Cut) spans the shorter side and 2×4 Runner (Rough Cut) span the longer side, notched together for strength and to resist warping. Engineered connection brackets for anchoring to concrete pad and wood decks. Hemlock Wood Top, Pre-Stained to your choice of one of our available standard stain colors. Pressure treated wood 6×6 posts sleeved in white vinyl with decorative base and capital. Double ply 2×8 headers on all four sides creates a completely finished look. 2×6 Joists (Rough Cut) spans the shorter side and 2×4 Runner (Rough Cut) span the longer side, notched together for strength and to resist warping. Engineered connection brackets for anchoring to concrete pad and wood decks. 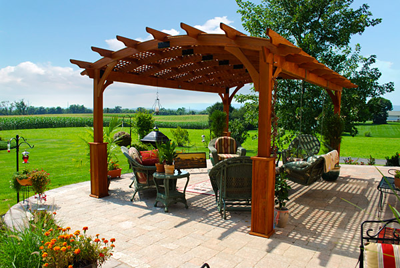 Unstained pressure-treated pine wood, solid laminated 5″x5″ posts, 2″x6″ arched joists utilizing engineered connection brackets for strength. 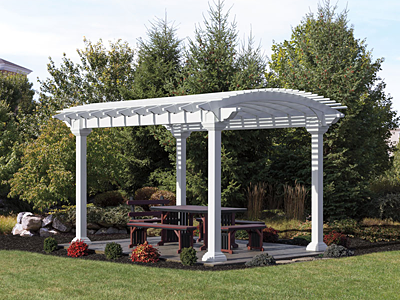 Arched Rafters span across even measurement side and 2″x6″ runners with scalloped ends spans odd side. Both with notched intersections to resist warping. Triple ply 2×8 header for added strength to maintain a straight non-sagging appearance, mounting brackets for concrete pad and wood decks. Maintenance-free white vinyl top. Solid pressure-treated wood 6×6 posts sleeved in vinyl and decorative base and capital. Double 2×8 headers with pressure treated wood sleeved in white vinyl for strength and a non-sagging appearance. 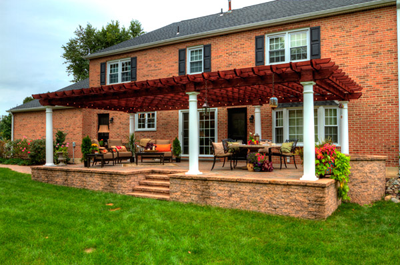 Full width 2×6 rafters joists that span across the shorter side and 2×2 runners span the longer side. Anchor brackets for anchoring to concrete pad and wood decks.